Iran launched multiple ballistic missiles today as part of a series of military drills conducted by the hardliner Revolutionary Guards Corps. 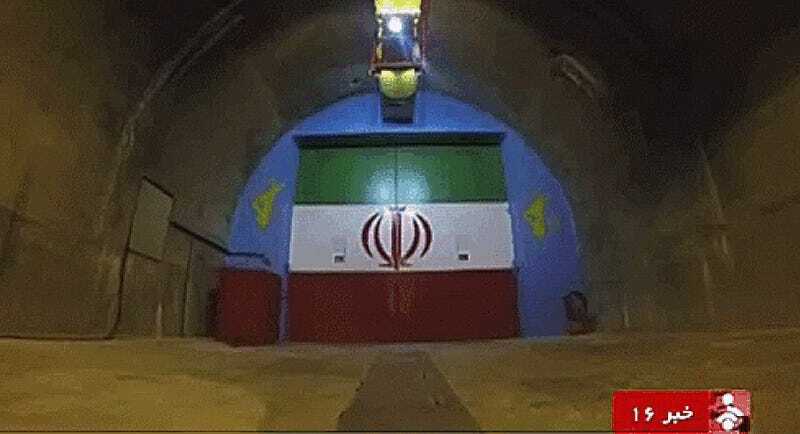 The missiles emerged from one of Iran’s elaborate underground missile caves, a version of which emerged late last year on Iranian state TV, but this is the first time we have seen them in action—and they look like leftovers from the set of a ‘70s James Bond flick. The missiles fired during the drills have ranges up to 1,250 miles, putting Israel (and anywhere on the Arabian peninsula) in their sights. Considering the extremely poor state of relations between Iran and Sunni Arab states, Iran’s ability to shower their countries with ballistic missiles fired from hardened launch sites is not a welcome development. The test launches also come much to the chagrin of the U.S., which just last January slapped sanctions on any business related to Iran’s missile development program following a series of test launches last October. The U.N. Security Council prohibited Iran from conducting any operations or activities related to missiles that could be capable of carrying nuclear weapons under Resolution 2231. Yet seeing that the nuclear deal pretty much eliminated Iran’s nuclear threat, the missile launches may be hard to classify as nuclear related, at least enough so to push the UN Security Council to punish Iran for them. There is also the fact that many of the countries on that board are now benefiting from vastly increased trade potential with Iran, which is flush with cash following the unfreezing of tens of billions of dollars assets as part of the nuclear deal. Iran says that the launches were to showcase Iran’s deterrent capabilities, and that is probably pretty accurate, at least for now. Iran also said today that it is looking at possibly exiting the nuclear deal, claiming national interests were not being met by the deal. This statement is very likely just bluster to satisfy the delicate situation between moderates and hard-liners back home, and at this point Iran would have to largely start its nuclear program over from scratch as the vast majority of its nuclear material has been removed from the country. However, the fact that it is being stored in Russia, which has tightened relations to an extreme degree with Tehran recently, could be an issue. If Iran were to “take their money and run,” so to speak, and exit the nuclear agreement, the outcome would likely come at a high price. It has been recently been reported that the U.S. was preparing to unleash hell on Iran via cyber attacks if they were to have walked away from the nuclear talks before the deal was finally signed. Doing so would also make it clear that negotiating with Iran is hopeless and military options for dealing with the nation would be elevated to whole new level.